Scroll down for the full product description. FREE UK Delivery. We guarantee to beat the prices offered on Amazon or eBay for brand new, like for like products! The 5610 series trail cameras from Ltl Acorn not only offer the ability to record superb HD video at 1080P (15ps) or 720P (30fps) with crystal clear audio but they can also take photos at 14MP quality (interpolated). The 5610 Ltl Acorn series uses the large 44 led infrared array for powerful night vision. The brightness of the night vision can be adjusted with 3 different strength levels available. It’s available with the standard lens (5610A) or the wide angle lens (5610WA) version. The standard lens offers a 55 degree angle of view and the wide angle offers 100 degrees. Other usual Ltl Acorn camera features such as the ability to set Timers (if you want the camera to only trigger and record at certain times of day/night), Time lapse (which can be used to set the camera to only take a photo or record a video at certain intervals, i.e. one photo every 60 minutes for instance), Time/Date stamped footage, SD card recycling, password protection etc etc. An additional feature of the 5610 series Ltl Acorn wildlife cameras is that you can input GPS co-ordinates for the camera location. 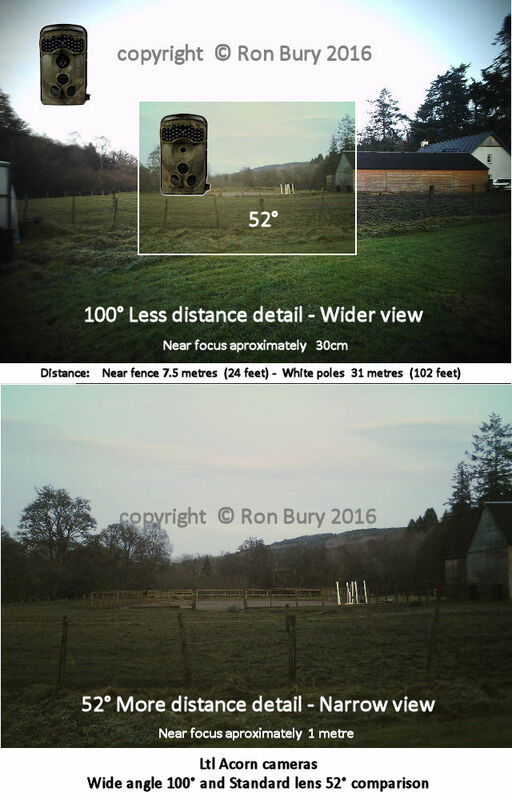 These co- ordinates will show in recorded photos/videos properties, so when you are reviewing the recordings later you will know exactly where the camera was located – often very useful for wildlife field research. The Ltl Acorn 5610A & 5610WA can utilise up to a 32G SD Card and can hold a maximum of 12 AA batteries, although it can run of just 4. Battery choice is vital for the performance the Ltl Acorn wildlife trail cameras and we do not recommend using any batteries with a mA rating of less than 2500mA. We use the Panansonic Eneloop Pro 2500mA or the Vapex Instant 2500mA Rechargeables with the Low Self Discharge technology, both brands work very well with the Ltl Acorn cameras with the Panasonic batteries coming out on top! Apart from the camera, what else do I need? You will need at least 4 batteries, make sure you use batteries with a mA output of at least 2500mA. Avoid Duracell or any Alkaline batteries. We use daily, and recommend, the Panasonic Eneloop Pro 2500mA rechargeable batteries or for a slightly cheaper alternative, the Vapex Instant 2500mA rechargeable batteries. You will also need an SD card, the 5610 trail cameras can take up to 32G max. Ltl Acorn cameras do not work without an SD card inserted. Always use SDHC, class 10 cards. Since January 2018, the Ltl Acorn trail cameras now feature infrared brightness adjustment, this helps if you are trying to record video or take photos of subjects that are close to the camera and allows the user to adjust the night vision power in accordance with their own application – so “white out” problems in dark conditions can be eradicated. Another new feature added to the Ltl Acorn cameras in early 2018 is the much reduced standby power consumption, this means that your batteries should last a lot longer than previously and puts Ltl Acorn cameras one step ahead of much of the wildlife camera competition out there! Do not leave discharged batteries inside your Ltl Acorn camera for any prolonged length of time. The batteries will leak and this acid will corrode the circuit board. Battery leakage is very easy to spot and is not covered under the manufacturer warranty. Cleaning the on/test/off switch on your trail camera is excellent ongoing maintenance and it’s a very simple procedure, no need to take the camera apart or anything like that. Click here for how to clean your Ltl Acorn camera switch. Pakatak Ltd will always beat the prices available on Amazon UK for the Ltl Acorn wildlife camera range. Dealing direct with us also means much faster support and access to help direct from Ltl Acorn themselves should you require it. My rating is for the look of the camera because I have not tested it yet. But 10 out of 10 for Pakatak Ltd.
Open the hatch at the base of the camera & insert an SD Card (32G max – use SDHC, class 10 cards) and AA batteries (at least 4). Please read the section further down the page about which batteries to use, battery choice is vital to the performance of your Ltl Acorn wildlife camera. Carefully remove back plate from camera body using the clips on each side and hand-tightening screw on the back. Flick the switch on the bottom of camera to the TEST position. The LCD screen will come on (it will go straight off again if you have not inserted a compatible SD card). Push the MENU button & use the arrow keys to select & change settings. Remember to push OK button after each setting change to save it. Flick the switch to the ON position, LCD screen will the switch off automatically & the camera is now ready to start recording whenever motion/heat change is detected. You will see a red light blink on the front of the camera for about 10 seconds after switching the camera into ON mode, this is to give you time to move out of the sensor range to avoid recording yourself. Doesn’t matter if you get the odd selfie though! Close bottom hatch & re-fit back plate before putting camera in chosen location. Use the side clips and the screw on the back to best seal the camera from the elements. The screw also takes some of the strain off the side clips. In TEST mode push the Replay/OK button to enter Playback mode. Use the up & down arrow buttons to scroll through your recordings. Press the Shot/Right Arrow button to play a video clip. Press the OK button again to leave Playback mode. For email product support please contact alan@pakatak.co.uk, alternatively you can get in touch via the website live chat facility. Please note, your 1 year warranty is always looked after by your retailer. However, here at Pakatak Ltd, we carry Ltl Acorn spare parts and are always happy to test your camera for you if you think it has developed a fault. Batteries are not included but battery choice is vital for the performance and efficiency of your Ltl Acorn trail camera – do not choose any batteries with a capacity lower than 2500mA. We recommend Vapex Instant 2500mA Low Self Discharge Rechargeable AAs or, even better, Panasonic Eneloop Pro 2500mA Rechargeable AAs which you can purchase directly from us, they work very well with the Ltl Acorn trail cameras and are excellent value for money too. We use these batteries every day and so can vouch for their compatibility. DO NOT use Duracell or other “off the shelf in the supermarket” Alkaline batteries as they are unlikely to be powerful enough and so will reduce the performance level of your camera. Using batteries that are not powerful enough will often cause a problem with video recording at night time in dark or low light conditions. So you may find that your camera works perfectly during the day but then only records 1 second videos at night time (even if you have it set to record 10 or 20 second videos) for instance. This is due to the extra power required to run the infrared array, so the camera triggers to record and starts the recording, it then realises it does not have enough power to run the infrared for any length of time and so shuts down back into standby mode. This can happen over and over again whenever the camera is triggered, leaving you with lots of very short videos! Do not use any battery with a mA rating of less than 2500mA. Power issues can bring about many different and strange glitches and problems with any trail camera so it’s very important to use a battery that outputs enough power before assuming you have a fault with the camera itself. IMPORTANT – Do not leave batteries inside the camera if you are not using it, this could result in acid leak and ruin the camera – this is not covered under warranty! Always use genuine branded SDHC, class 10 cards. There are often many fake cards on the market (especially being sold on eBay & Amazon etc). Also, always format your SD card using the “format” option in the camera menu and format the card on your home computer too if you are experiencing any problems. SD cards do not last forever, if you think that yours may have developed a fault then try a new card before assuming your camera is faulty. Remove all batteries & SD Card, bring the camera inside for 24hrs then test again. When in TEST mode, push the menu button and scroll down to “Default”, push OK to return your camera back to factory settings. The infrared beam is powerful so don’t position the camera too close to any solid objects as your night shots could suffer “white out” issues. On cameras that came out of the factory from around early 2018 onwards you may have the Infrared Brightness Adjustment feature too. This feature allows you to adjust the strength of your cameras infrared beam and can help reduce white out problems with night time images or video. When moving the camera in your hand you may notice the IR cut filter moving in front of the lens, this is perfectly normal. When the camera is in operation, it will decide if the cut filter is needed automatically depending upon light levels. We take a lot of calls and messages from customers thinking that they have a broken part on their camera but this is not the case! If you find that your camera is not responding correctly to the switch position you have selected, for instance the LCD screen does not come on in TEST mode but the camera works fine in ON mode, or if you have the camera in TEST mode but it is acting as if in ON mode then it may be that the switch contacts have become dirty. This is something that is worth doing periodically anyway to ensure the best performance and longevity of your Ltl Acorn camera. If your Ltl Acorn 5610A or 5610WA camera was bought from Pakatak Ltd after August 2016 then it will have the option of choosing from 9 different languages. The options are English, Danish, Dutch, Italian, German, French, Russian, Czech or Finnish. When you have the camera in TEST mode, push the left arrow key to run through the various language options. Please let us know by emailing alan@pakatak.co.uk if you think of any other useful information that should be added to this guide. 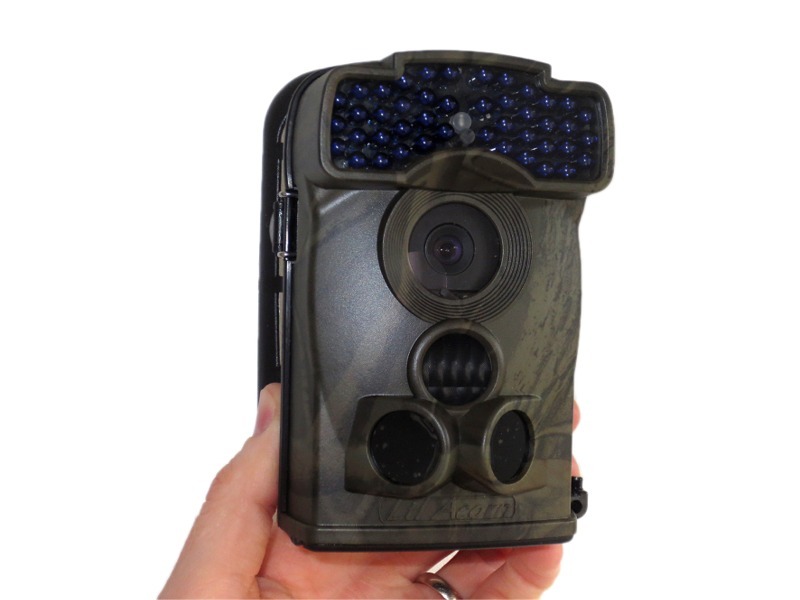 Pakatak Ltd are the largest UK distributor of the Ltl Acorn range of wildlife trail cameras and deal directly with the manufacturer (we’re the only UK based company to do so! ).